Advancements in genetic testing has meant that we can now preempt and address any possible illness, determine best medication choices and give us insight into how we should be adapting our lifestyles in a way that will help to keep us healthier for longer. A little while ago, I had a DNA Skin test done with optiphi and DNAlysis, a Joburg-based genetics testing company. 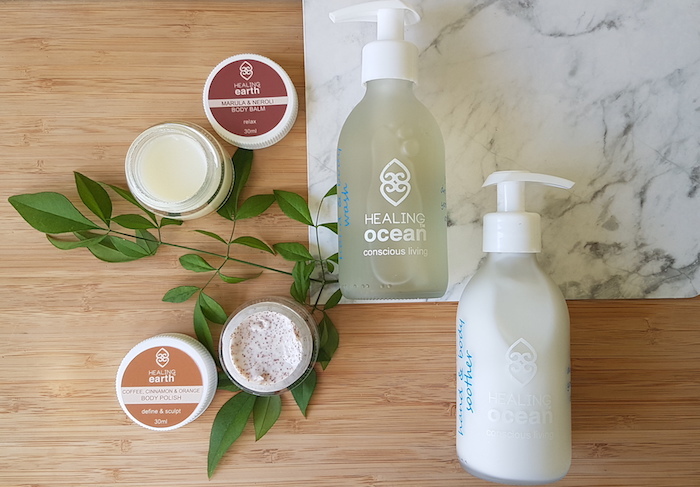 The results from that test have helped me to make better-informed decisions on skincare treatments for MY skin. So obviously, when DNAlysis offered me the opportunity to do some of the other tests they offer, I jumped at the chance. 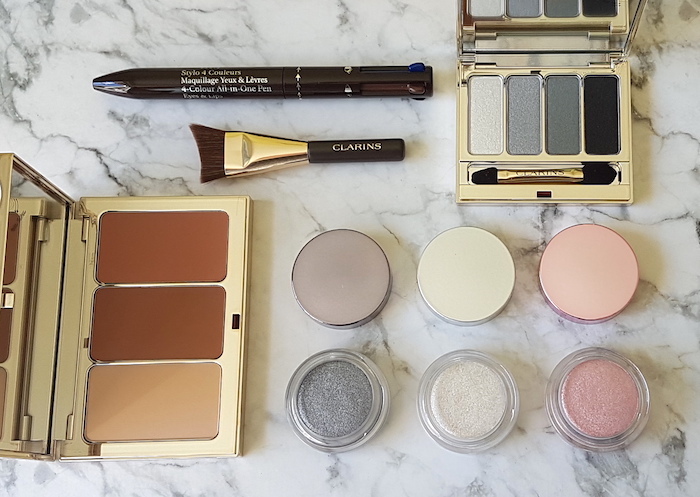 A quick swab of the inside of your mouth is all you need to do in order to do the tests – I only did this once for all 5 (these 4 and the DNA Skin, which you can read about in this post). The tests are based on the fact that a strong relationship exists between our genes and the environment in which we place ourselves. Whilst we cannot change our DNA, we absolutely CAN change the manner in which certain genes are expressed. So, don’t look at these tests as being diagnostic, but a look into your future health that you are able to manipulate by knowing which areas pose a possible risk further down the line. We are bombarded with SO MUCH INFO on a daily basis that it’s difficult to see the wood for the trees, and impossible to know what approach will work best for you. These tests do exactly that – they tell you what YOUR body needs and why. I’m going to share some of my results with you (I can’t share them all, or this would be the longest post in history), but don’t be alarmed if it looks very scientific and complicated. Your results are sent to your practitioner, so you don’t have to decipher these yourself. You will then go through each one in detail with your practitioner, who will have looked at all of the results as a whole and summarized the key points for you to take away from them. Genes are segments of DNA that contain the instructions your body needs to make each of the many thousands of proteins required for life. Each gene is comprised of thousands of combinations of “letters” which make up your genetic code. The code gives the instructions to make the proteins required for proper development and function. With the exception of identical twins, all people have small differences (variations) in their genetic code. It is these differences that make each of us unique. In the same way as a single letter change can profoundly change the meaning of a word, so single base changes can profoundly affect the function of our genes. How to you get all this info? From the buccal swab sample, a process called the Polymerase Chain Reaction (PCR) is used to copy the DNA of your genes many times over so that it is possible to generate sufficient quantities to analyse your genetic material. 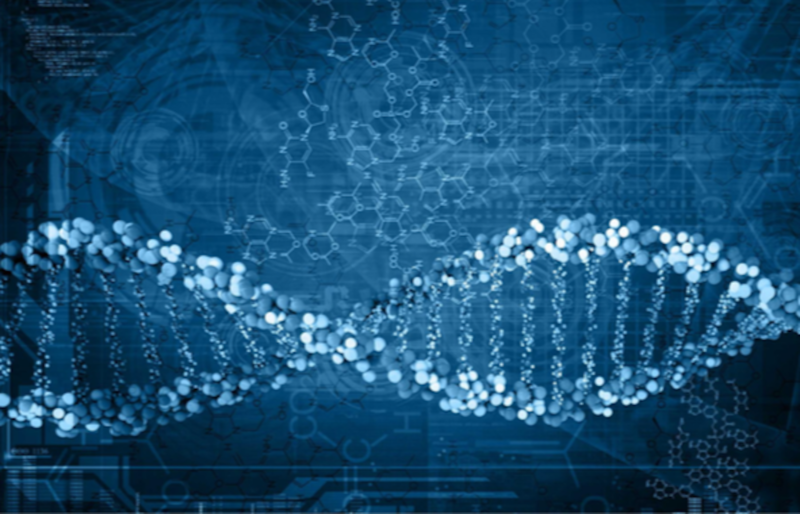 We then identify unique DNA sequences in some of your genes. 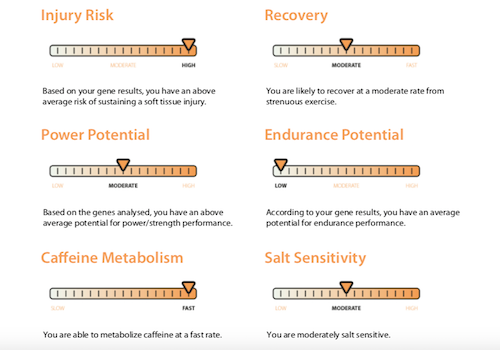 Certain changes (polymorphisms) in these genes have been studied in detail, with evidence that correlates these polymorphisms with an individual’s risk of developing certain chronic disease conditions, altered metabolic processes, assess areas of intervention for improved weight management, identify Oestrogen related risks, how to improve athletic performance and minimise injury, amongst many others. 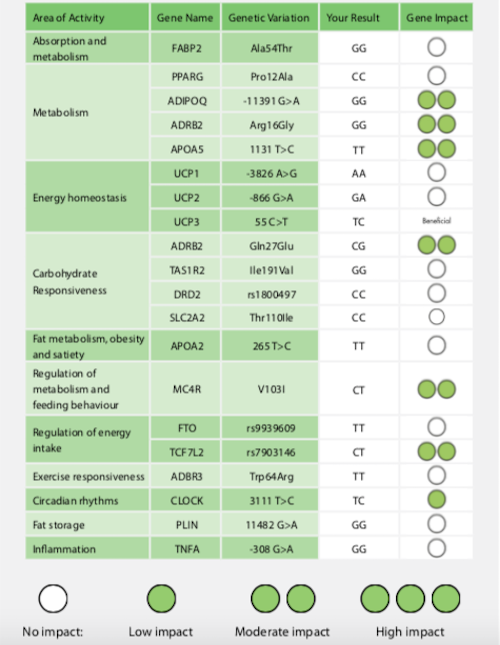 Having identified the presence or absence of these polymorphisms, we are able to qualitatively assess particular areas of health risk related to the specific genes. 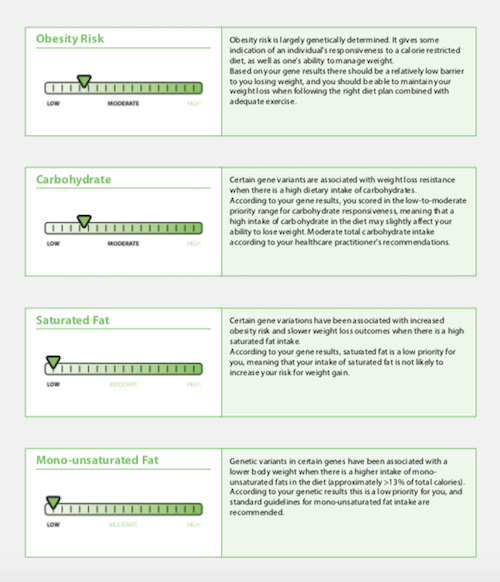 Based on our analysis of your genes we have calculated your score to determine which of three possible diet plans (low fat, low carb and Mediterranean) is likely to be the most effective for you. Once you have established the optimal diet type, there is scope for further personalisation by considering the genetic contribution of relevant diet and lifestyle factors. We consider the following diet and lifestyle factors that contribute toward weight management: obesity risk, eating behaviour (snacking) and taste preferences, responsiveness to saturated fat and poly-unsaturated fat, and carbohydrate intake, as well as amount and intensity of the importance of mono-unsaturated fat intake and exercise. Here are some of my results. 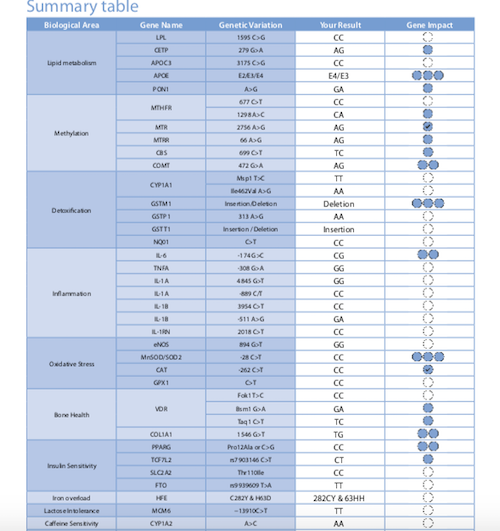 The first table is a summary of all the genetic variations they test for. 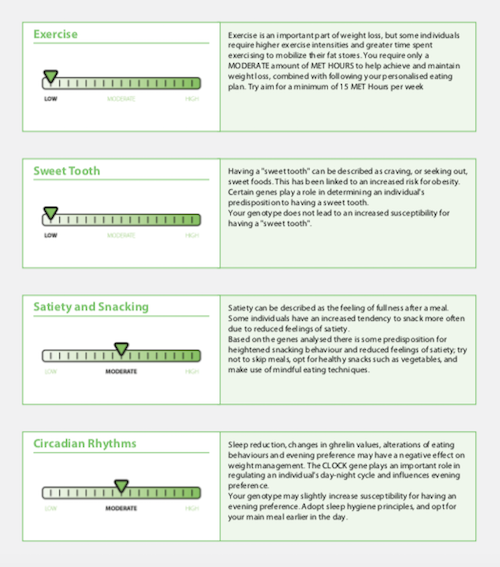 In the last column, you can see how much of an impact that specific variation could have on my diet and wellbeing. As you can see from the below, I have low to moderate risk for all of the factors below. I need to be aware of over snacking and get more sleep. No big surprise there, but good to know that these are two areas to really focus on! Lipid Metabolism: Heart health depends on a complex balance of environmental, dietary and genetic factors. Certain genes influence LDL and HDL cholesterol levels; higher levels of LDL, or ‘bad’ cholesterol, and lower levels of HDL or ‘good’ cholesterol, are associated with a higher risk of heart disease. Methylation:B vitamins provide building blocks for growing cells, which are constantly being renewed, and play an important role in many physiological processes. B vitamins also supply some of the chemicals necessary for protecting our genes, so that DNA doesn’t accumulate damage from the wear and tear in the daily lives of our cells. These vitamins – including folate, vitamins B6 and B12 – help make new DNA for cells that are constantly growing and renewing themselves. B vitamins are also involved in turning many genes on and off, and also help repair DNA. The process of DNA repair is called methylation. Methylation uses the process of donating ‘methyl groups’ to a substrate. A methyl group consists of one carbon bound to three hydrogen atoms (CH3). Although B vitamins are only required in small amounts, they are crucial for methylation and in producing new DNA. Detoxification: The detoxification process in the body is governed primarily by the GST family of enzymes. Glutathione S-tranferases are responsible for catalysing reactions in which the products of Phase I metabolism are conjugated with glutathione, thus making them more water soluble and more easily excreted from the body through sweat and urine. Cruciferous and allium vegetables help increase the activity of your detoxification system, which aids the removal of harmful substances from your body. Inflammation:Inflammation is a normal immune response and an essential step in tissue healing. The release of these inflammatory substances is controlled by genes that govern inflammation. However, when these genes are not ‘switched off’ the inflammatory response continues. 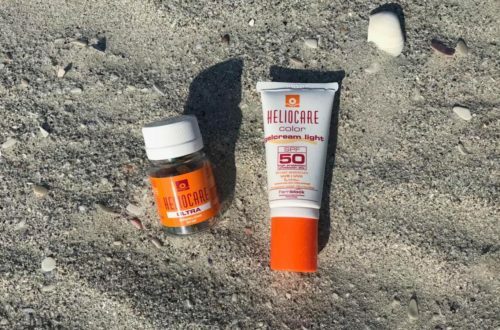 An increasing number of common disorders, such as obesity, heart disease, arthritis and inflammatory bowel disease have been associated with chronic low-grade inflammation. Oxidative stress:Free radicals are a normal by-product of the body’s energy-generating biochemical processes. They are highly reactive with other molecules, and can damage DNA, proteins and cellular membranes. Anti-oxidants are free radical scavengers that interact with the free radical to ensure it is no longer a reactive molecule. Anti-oxidants are found naturally in the body in the form of enzymes, but can also be consumed in a wide variety of foods, especially from vegetables and fruit. However, the major role in anti-oxidant defense is fulfilled by the body’s own anti-oxidant enzymes. Bone Health: Our bones are not a fixed structure. Our cells work continuously to dissolve old bone and create new bone tissue. After the age of 30, both men and women start losing bone mass; the loss is particularly marked in women after menopause. According to latest research both nutrition and genetic factors play an important role in determining bone health. Insulin sensitivity: Insulin is a hormone that stimulates the uptake of glucose from the diet into the cells. Those with lowered sensitivity to insulin have a limited ability to respond to the hormone’s action. The scientific literature suggests that insulin insensitivity or resistance may play an important role in some of the most common disorders – including, obesity, type 2 diabetes, high blood pressure, heart disease and disrupted fat metabolism. Food responsiveness: Particular nutrients and certain food components in different foodstuffs can affect individuals in different ways. With new research coming to light in this area, specific genes can be tested to give more insight to how an individual might respond to a particular food component. The areas of food responsiveness covered in this panel include: Lactose intolerance, polyunsaturated Fat (PUFA) metabolism, caffeine sensitivity, salt sensitivity and iron overload, as well as bitter taste and alcohol metabolism. From my results summary, you can see that I have 3 areas that need serious attention. 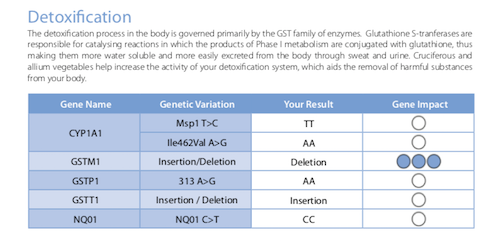 I’ve included the in-depth explanation of the Phase II Detoxification GSTM1 Insertion/Deletion variant and what I can do to minimise this risk. 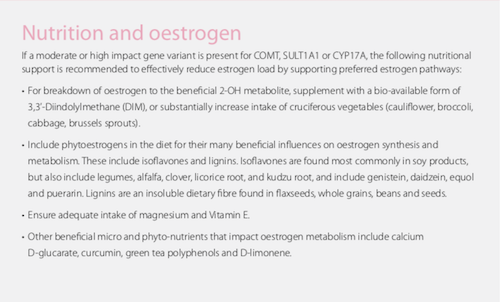 in these biological processes help identify a sub-population of women and men with higher lifetime exposure to oestrogens, oestrogen metabolites and other carcinogens. Understanding an individual’s genetic variability will allow for targeted diet, lifestyle and hormone intervention. This test really interested me, as since my pregnancy, I am both in awe of and terrified of the power of hormones (hello, breastfeeding insanity). Detoxification Insertion/Deletion features as a risk area here for me, too, so something I’ve really been working on. 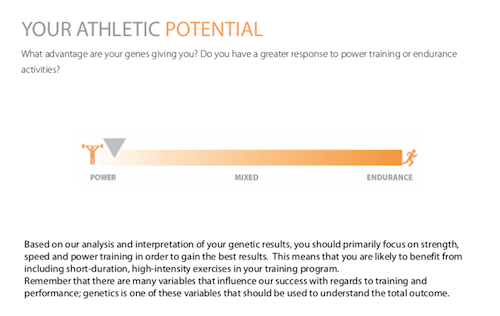 Certain genetic variants are advantageous for athletic performance, while some variants may contribute to an increased risk for injury or delayed recovery time. 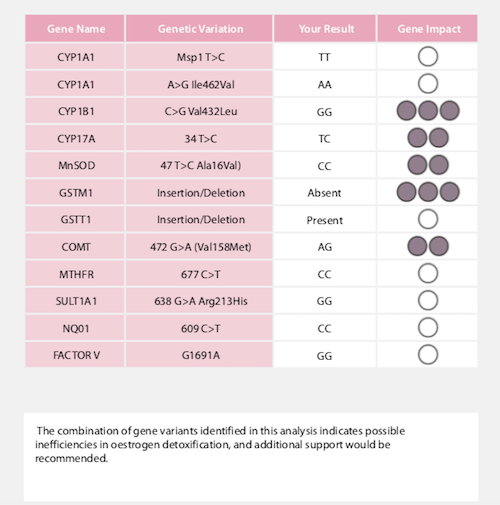 Details of gene names and variations that we tested are outlined in this report. Gene explanations are detailed at the back of the report. Training and nutritional recommendations that may benefit you will be given. I’m not, by any stretch of any imagination, an athlete. I was at school, and that was a verylong time ago. But I still was super interested in these results. I tried to be a runner for years, with no success, but turns out it could just be my genes. I am, however, pretty good at martial arts and other power type sports. I am very prone to injury, and had already started pilates before I did this test, which was a big step in the right direction. 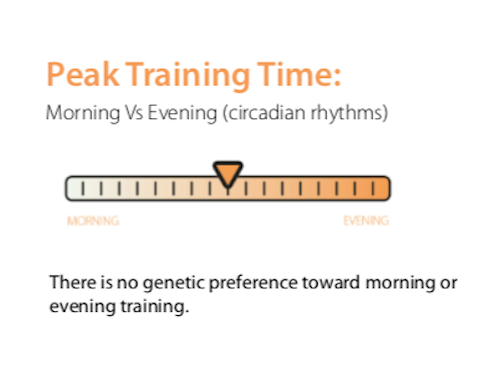 The result I found most interesting was the peak training time that found me smack-bang I the middle, with no preference to either morning or evening training. I loathe doing high intensity training at the end of the day, as I find I am too wired to sleep, but don’t you dare expect me to do yoga first thing in the morning, as my body is just not warm enough to stretch! So I guess it just depends on the nature of the training. Okay, phew, if you are still here, you must love science as much as me! I hope this was helpful for those of you who have been interested in these tests, but were a bit unsure of the process and just how much info you get. Neurodegenerative disorders (alzheimer’s disease, dementia, cognitive decline), addictive behaviour (a risk for alcohol, nicotine, cannabis & opioid dependence; Psychosis response from cannabis use; eating disorders (binge eating)), adrenaline-seeking (risk-taking behaviour) and mood regulation (depression, bipolar, anxiety and post-traumatic stress disorders). If you have any further questions, or want to chat about how the processes works in more detail, you can jump onto a live chat with a DNAlysis consultant on their website here.